On weekend mornings Pearl and I have a little ritual. I brew coffee while she’s having her breakfast and then we head to the sunroom to watch the light return. On the way to the kitchen I’ve already turned on the music. I know that the air I need is a mixture of oxygen, nitrogen and some other rare gases but for me one more ingredient is needed: music, preferably classical which Pearl enjoys as well. This morning it’s Dvorak’s Stabat Mater. After her breakfast she joins me for this adoration of life and the beauty that is there for us as we choose to see and enjoy. 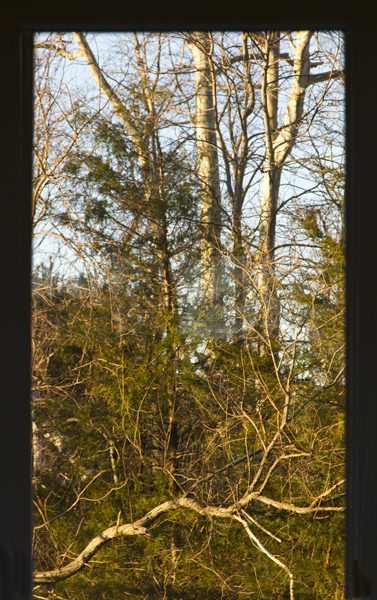 Above, the return of early, warm light on the nearby woods through a garden room window. I am at peace but feel ebullient about the day ahead … the caffeine, no doubt, but the total experience makes it worthwhile for having gotton up. If I could get a decent picture through my patio screen, I’d send you a photo of a Great Egret hunting. Here’s to many more beautiful mornings. Cheers! Everyday I see the sun rise is a beautiful day! I share my morning coffee with my kitty, Kallie. She likes her personal time with mommy! you enjoy it along with Pearl. What a lovely way to greet the day! I love the composition with the tree in the very front. My morning coffee has me covered in 4 kitties, haha. Dad, I still remember, easily 40 yrs ago, how after dinner you would go into the living room and listen to one of many classical collections you had, on the stereo. To this day I can recognize composers because you’d share your love of classical!